50 years after the last eruption, in April and June of 2011, the Puyehue-Cordón Caulle Volcanic Complex in Ranco Province, Chile, began to awaken again. Here, on June 4, the Cordón-Caulle fissure blew open in a fantastically powerful event. The eruption threw a hundred million tons of ash 6 miles (10 kilometers) into the air, displaced more than 6,000 people, caused hundreds of millions of dollars in economic damage, and severely impacted the surrounding environment for hundreds of miles. 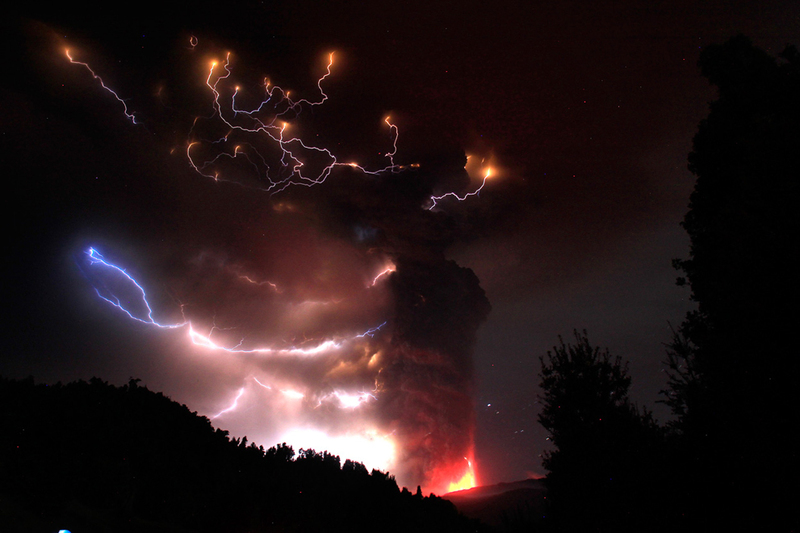 In this particular image, we see the plume of ash surrounded by volcanically triggered lightening. This would certainly have been an awesome scene to behold, shortly before getting the hell out of there, that is. This article is part of a series, Earth: The Pale Blue Dot, which explores and highlights some of the amazing and beautiful natural features of the planet Earth.